We are an incomparable name in offering a superior quality Dry Cylinder Liner. The offered cylinder liner has a flange at the outer circumference of the upper part of a liners barrel. This cylinder liner is broadly valued by our patrons and is checked on numerous parameters by quality controllers at our end. We manufactures wet and dry cylinder liners with honnong and sleeves for all engine applications for its quality conscious customers. Cylinder Liners, made of grey cast-iron, ought to have desired casting and machining qualities, viz. strength, toughness, hardness and wear resistance. These are mainly of two types – Dry Liners and Wet Liners. 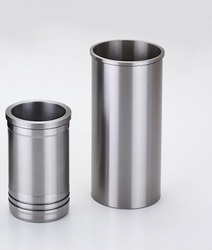 The Cylinder Sleeve or dry cylinder liners has a flange at the outer circumference of the upper part of a liner, and also has a grind groove formed below the flange at the outer circumferential surface of the liner. Being one of the renowned firms in the industry, we are decidedly involved in providing a premium quality array of Dry Cylinder Liner. We are a unique entity in the industry, actively committed towards offering the optimum quality range of Dry Cylinder Liner. - TOTAL LENGTH = UP TO 350 MM. 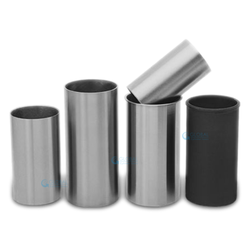 With the significant support of our professionals, we have evolved as the foremost manufacturer and supplier of excellent quality Dry Cylinder Liner that is provided in scores of specifications in tandem with the clients' diverse requirements. It is a cylindrical part that is fitted into the engine block to form a cylinder. We are one of the reputed names that stands out as a Manufacturer and Supplier of a wide gamut of Dry Cylinder Liners. The basic features of our Dry Cylinder Liners are that they are sturdy, resistant to corrosion, durable, require low maintenance and undergo low wear. Also, our Dry Cylinder Liners can be availed from us at competitive prices.